It seems that gold is well and truly the new black when it comes to designer engagement rings for 2016. For many years, white gold and platinum have topped the charts for the most popular metal but the buttery hue of yellow gold is well and truly back on form with it gracing the collections of many jewelry designers. 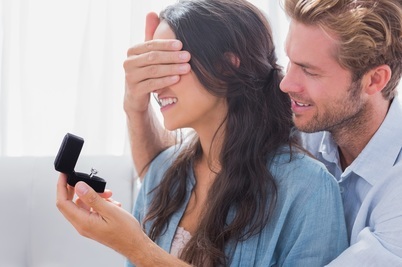 Colored diamonds, precious gemstones and ornate filigree work are also going to be popular so if you’re hoping to get engaged this year, here are the styles you’ll be seeing when you’re choosing the ring for you. White metals have pretty much dominated fashion trends for jewelry over the last decade but it seems that gold has finally fought back to be seen as the number one choice for engagement rings. As well as yellow gold, a surprise addition to the pack is rose gold being requested for bespoke rings and in turn there are more and more designs with this soft pink colored metal being seen in high street stores. It’s particularly popular with those wanting vintage designs such as Art Deco pieces with another 2016 trend; Emerald and Asscher cut diamonds. The use of semi-precious gemstones as central parts of engagement ring design was last seen as a top choice in the 1980s. Often a central stone with a floral design of diamonds around it, the sapphire or ruby surrounded look fell out of fashion by the 1990s when solitaire diamonds rocketed in popularity to tie in with the beginning of bling. The wheel of fashion has turned and now rubies and sapphires feature again but this time as beautifully crafted single stones without the frills of the past. Joining them are colored diamonds; a huge player in the gemstone market with the 250 hues of rarity jostling for top position with the traditional colorless diamond. For those with deep pockets, rare reds are being seen on the fingers of celebrities as well as more affordable browns, yellows and the mysterious look of black diamonds. For anyone wanting a hot look with a gemstone which shouts unique, color is the way to go. Filigree work – also known as an intricate profile was very popular in Edwardian designs. The metalwork of the early 1900s showed beautiful art nouveau patterns with twisting branch-like strands of gold encircling the chosen gemstone. Fast forward a century and filigree work is definitely de rigour for those wanting an elegant engagement ring which is also rather unusual compared to styles of recent years. Vintage looks and rectangular stepped stones combine to give beautiful and feminine options for anyone wanting an engagement ring which is a solitaire stone but with an exquisite side profile of woven precious metal. The perfect combination for the most stylish ring possible this year then is a yellow or rose gold ring with a large colored diamond which sits on a setting high above delicate-looking filigree fret work. Such elegance is bound to mean that this style will become a future classic, so if you’re fortunate enough to be proposed to this year, it’s certainly a look to strongly consider.